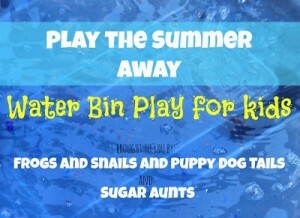 We are really excited about this weeks theme in our Play The Summer Away: Water Bin Play For Kids Series with Sugar Aunts. We have yet to play in anything Swamp themed. So this was fun and new to us. We used items we already had at home but had never put them all together this way. If you would like to read more on sensory play in water bins and keep up with our water bin series for the month of July CLICK HERE. 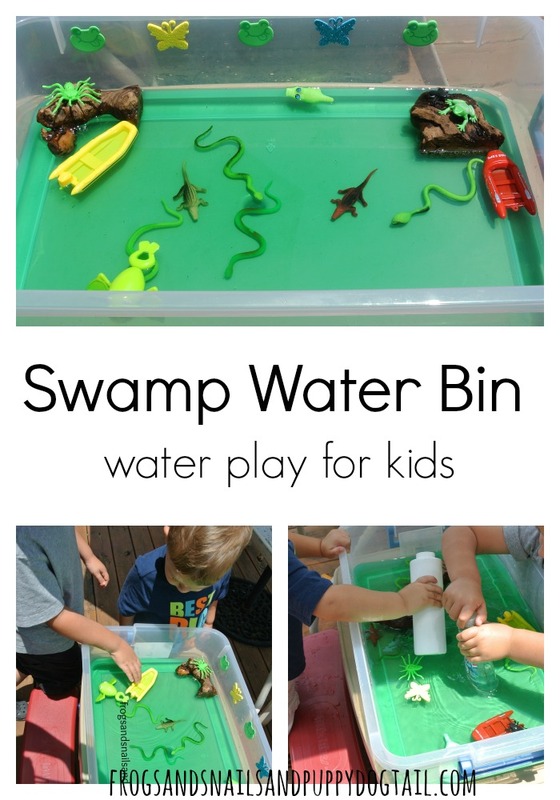 It will take you to the home page that will have a total of 10 water bin play ideas for you and the kids at or by the end of the month. I placed the foam stickers on the water bin. I placed the toys in the bottom of the bin and filled with water. I added blue and yellow color tablets to the water in the bin to make green water. I rearranged the toys and then had the boys come out. I went back for the funnels, squeeze bottles, and strainer. Those items were afterthoughts. I think they were a big hit too. When the boys came out I went over what animals a swamp had in it. 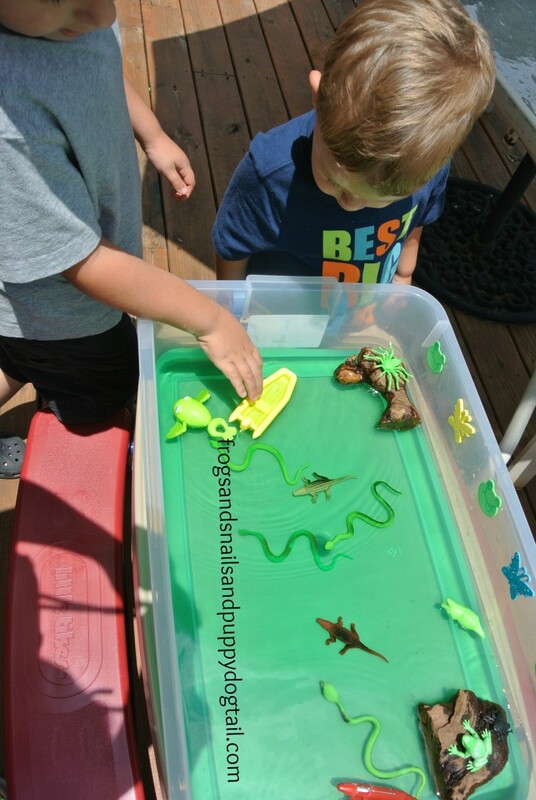 It has alligators flies, frogs, snakes… We talked about how people fish on boats in the swamp. We went over the color of the water and what you mix to get green. The boys started filling their bottles with water and squeezing them out and pouring water through their funnels into their bottles. Pouring and scooping are great for gross motor skills. They were problem solving as well deciding how to get the water into the bottles. Since this bin was set out for both my toddler and preschooler they had to work on sharing and taking turns. They played about 30 mins in their bin. With all that pouring and scooping the water started to disappear, lol. We cleaned up by taking all the toys out and dumping out the water. We left the toys and bin in the sun the rest of the day and put them up later. 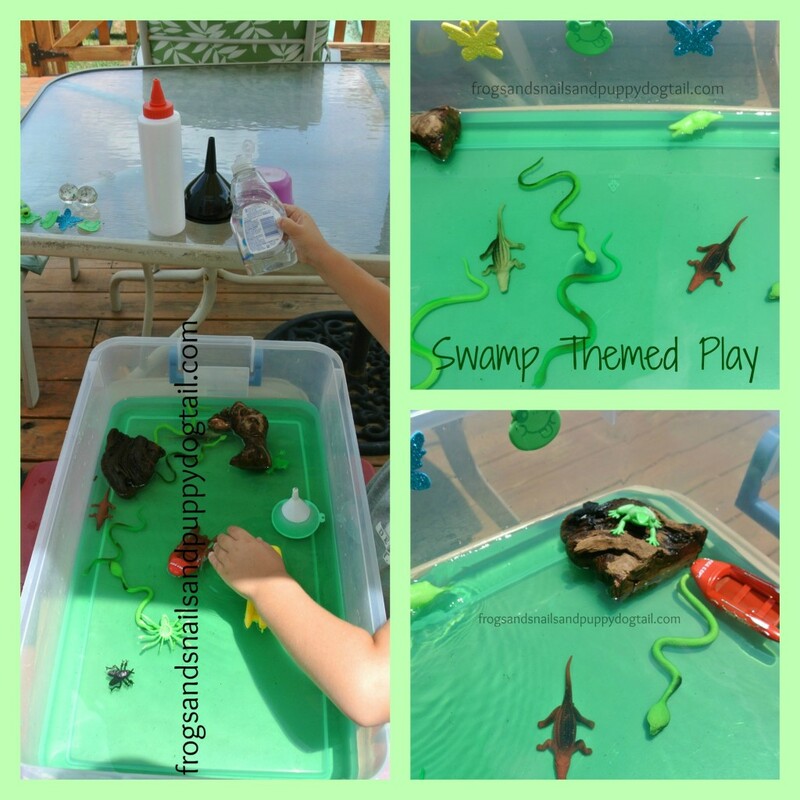 Make sure to stop over to Sugar Aunts to see what Swamp fun they had. 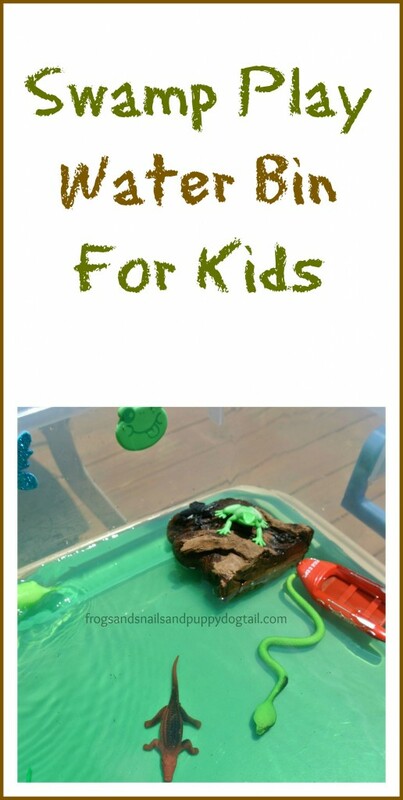 I always love their ideas for play and think you will too. 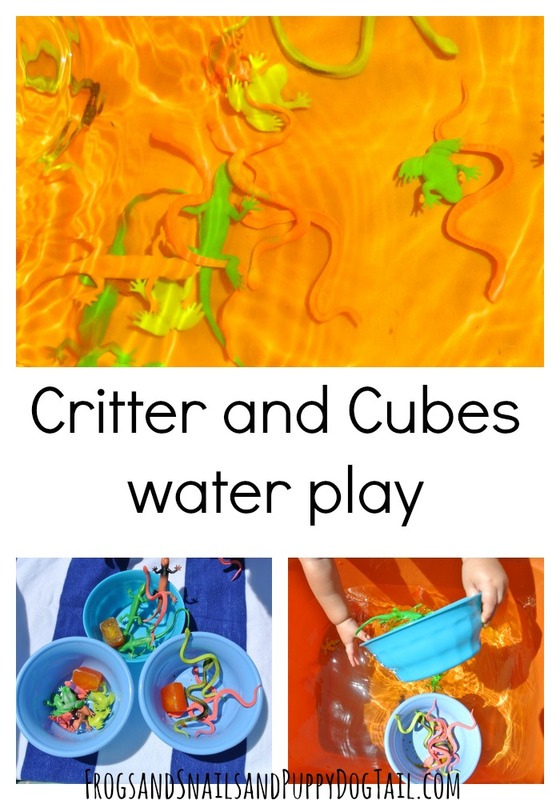 Don’t forget to stop back next week to see our new theme for water play with the kids. 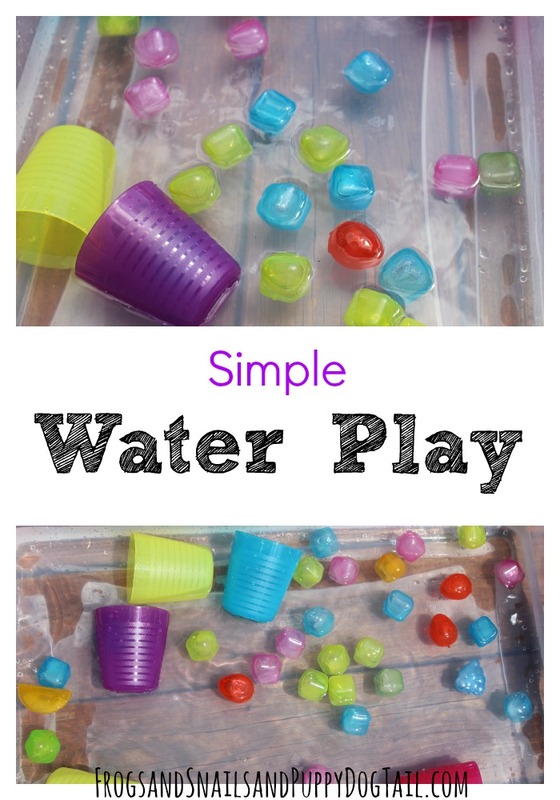 We have a Water Bin and Water Table pin board set up just for you to help you find fun ideas from around the web and to help you keep up with the Water Bin Series. We still have 3 weeks to go!